Various writing on music, including reviews, reactions and musings on the experience of music in culture and life. Warning: may contain opinions, and dodgy taste. Are you going to be watching the Eurovision Song Contest (final) tonight? Are you going to be watching it in the company of family or friends? Improve the experience by playing Eurobong-a-bingo! This Eurobingo PDF file contains ten player sheets filled with random Eurovision cliches and phenomena which may be observed during the show broadcast. Simply check off each as they appear – award spot prizes for completing a line, and the first person to complete a whole sheet wins the kitty (or another prize of your choice). There are also three additional ways to win: before the show begins, add your best guess for each of the quant questions at the bottom of the sheet. Closest wins! This game has been published under a Creative Commons Attribution-NonCommercial-Sharealike license. Feel free to adapt, remix and share it, but please leave attribution intact. Part of my tenth blogiversary series. 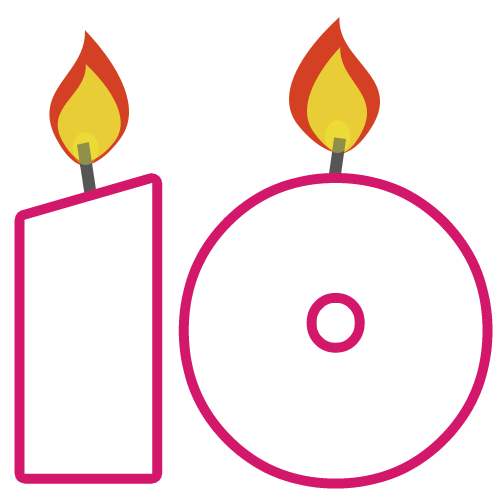 I missed the actual tenth birthday of this blog/me blogging but I can’t let a milestone like that go unmarked, can I? Originally started as a place to store and share links, this blog gradually became a place to playfully interact with the world, and over time that turned from introspection to exploration of the world, media, experiences and ideas. I don’t think I’m alone in that kind of journey with blogs. I am immensely (unreasonably, perhaps even pathetically) proud of having been blogging for so long. I can say confidently that I was in at the beginning, when all this were fields. I was here before many of you young whippersnappers who have gone on to eclipse me, and blogging, and the web entirely in their success and influence. I don’t put my early involvement down to canny prescience about the way the web was turning so much as an inevitability given my proclivity for tinkering with web things, my early academic and personal interest in communicating online and my inability to shut up. Blogging and me; it was only a matter of time and technology before we found each other. I was there. I remember the start, and the hype, popularisation, commercialisation and ubiquitisation which followed. I couldn’t possibly have known it at the time, but my blogging was to introduce me to dozens of interesting people, influence others to start doing it too, cause interesting opportunities (and worrying situations) to develop. Blogging has become part of what I am, what I do. I blog now for the same reasons I did in early 2000: because I can’t not tinker with and publish to the web. Ten years ago, I was embarrassed to mention having a blog in polite company, because it was so difficult to understand – not just what but why. These days, even both my parents have blogs. It’s not a weird niche oddball geek thing anymore. It’s so normal it’s almost passé. Good. As part of Quadriga’s Online Communication 2009 conference, I was invited by the organisers to present some reflections about how to communicate with people online, drawn from both personal and professional experiences, in the form of an after-dinner speech. This was a new experience for me: I’ve never done an after-dinner speech before. Lots of presentations, lectures, debates and panels, but nothing in quite this format before, with no visual aid, nestled in between main course and dessert. Rather than just post my notes, here’s a fully-written up version of what I said, including links to sources, resources, inspirations and further reading. Forgive the slightly odd formatting, with so many paragraphs – it’s structured this way to reflect the emphasis and pauses and topic sections as I spoke. If anyone wants it, I was thinking about making an audio version available to download, because this is fairly long (about 25 minutes) – let me know if this would be interesting to you. And if you’re interested in me giving this presentation (or one similar) at an event you’re organising, do get in touch. When I first told my friends I was coming to Amsterdam to speak to a room full of online communication executives, they asked me why I had to fly to Amsterdam to do that. Why do we all need to get together in one room? Couldn’t I just do it by email, maybe in a newsletter or a series of tweets? Well, maybe – but if that had been the case, I wouldn’t have got to enjoy such a delicious meal and wouldn’t have met so many of you face to face. So thank you for giving me the opportunity to do that. When Quadriga were putting together the conference programme, I was asked to present my perspective on online communication from “both sides of the wall” – as a keen online user both personally and professionally. I’s just like to note that that implies the wall is somehow this insurmountable, divisive thing which is rarely scaled. In fact, the walls are coming down. I think it’s remarkably easy – and getting easier – to hop from one side to the other, and in fact the boundaries are blurring for many of us every day. I count myself as incredibly lucky that my professional life draws on my personal experiences and passions. As part of that, I have a confession to make. The reminder a couple of weeks ago that pioneering blog publishing engine Blogger was launched ten years ago got me thinking. I’ve been blogging for nearly ten years now – since it began with a W – and being involved with something from the beginning, plus passionate (and sometimes despondent) about its potential and usage in the years since means I’ve had a lot of time to watch and think about how it has matured and been used. There are certain things which we can now look back on and consider milestones in the development and maturing of blogging – like how the media responded to it, how people embraced and used it and how it penetrated mainstream web usage over time. b) all my archived tweets (pre July 31 2009) have disappeared, as experienced by many others in this thread on the Twitter help forum. It’s actually that help forum – and the appalling petulant and rude manner in which some users are addressing Twitter staff – which got me thinking more specifically about how, in so many ways, the timeline of the Twitter story mirrors that of Blogger and early blogging. Both have seen similar patterns of early usage and behaviour and adoption by certain functional and social groups, and both have learnt – the hard way, sometimes – about technical and social scaling issues as well as being a playground for emergent behaviours and activities, and all the fun and challenge that comes with that. This isn’t an attempt to demonstrate that startups and new technologies are subject to many of the same pressures and reception issues – that’s been clearly documented and brilliantly expressed in Gartner’s Hype Curve. Rather, I wanted to explore some of the striking similarities in specific situations, movements and experiences in the early days of both micropublishing and blogging, from the perspective of an early settler and long-term resident of both of these strange and wonderful new(ish) countries. So here’s something I’ve been working on for a little while: it’s a very approximate timeline of the activities, patterns, behaviours and reactions experienced by both Twitter (/micropublishing) and Blogger (/early blogging) during their first few years.